Like many other cutting edge technologies – artificial intelligence, big data analytics – additive manufacturing, or 3D printing, has been incorporated into daily use at Land Rover Ben Ainslie Racing with the help of the team’s Technical Innovation Group. An example is the end cap for the boat’s bowsprit. This is a complex shape, designed to reduce the aerodynamic drag. It was ideal for 3D printing in plastic because there was no load involved, and a single item was required. In years gone by this would have been built in carbon fibre to the finish and standard of a piece of custom furniture, and at great expense thanks to the time and skill of those involved. Now, once the design has been developed it can be produced in a handful of hours for a few pounds. The components are manufactured from paper thin layers (typically 0.05 mm) of fine metallic powder (cornflour consistency). The system works in an argon inert atmosphere – similar to that inside a light bulb; heat can be applied to melt the metal powder without it burning; or reacting with oxygen or impurities found in air. The heat is applied using a laser beam – this is directed using software controlled mirrors, and focused to accurately weld the areas required to create the part. One of the earliest components the Land Rover BAR team created using this technology was a custom sheave case for the pulley in the daggerboard lift line. There was a high compressive load involved and it needed good resistance to wear; so metal was the ideal choice. All high strength metals have a higher density (weight per volume) than carbon fibre, so to keep weight down the final design was hollow. It would have been very difficult to make this part any other way than additive manufacturing. “The potential of additive manufacturing in terms of saving weight and improving efficiency is tremendous,” explains Claughton. “For example, we took a long hard look at our hydraulics system. Before 3D printing came along all the parts in this system would have been manufactured by taking metal away from a solid block. The shapes that you can create with this method are limited, so the design is limited and so too is the efficiency. 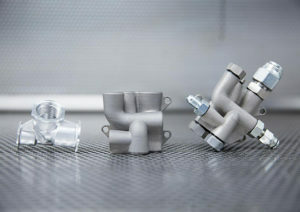 David Ewing, product marketing engineer at Renishaw’s additive manufacturing products division, says: “Our involvement with Land Rover BAR is also helping to raise the bar in additive manufacturing. It’s a complex manufacturing option and there are considerations both in component design and process expertise.